Dear Good Greatsby: How Can I Tell If My Neighbor is Dead? Today’s questions comes from Laura of Unlikely Explanations who wonders what is the politest way to determine if her neighbor is dead. Call the police with a complaint that Don has been peeping through your windows. It won’t take long for them to find evidence refuting your story if Don is dead. If the police do confirm Don’s death, you can save any embarrassment by pressing charges against ghost Don. Ask Betty if she would feel uncomfortable if you started dating Don. If he’s alive, and still living with her, she’ll probably answer yes, she would feel uncomfortable. If he’s alive, but not living with her, she’ll probably say no, but tell you Don was a bum and always forgot her birthday and sometimes used her back as a footrest. If he’s dead, she’ll tell you and call you an ‘insensitive clod’, but you can still save yourself from further awkwardness by replying, of course you knew, but you meant you were planning to date him in heaven. The worst case scenario is that Don is still alive, still living with Betty, and she doesn’t mind if you date him. In this case, it would be rude not to date Don after putting them both through so much trouble. How about dressing up as Don for Halloween this year and trick-or-treating at Betty’s house? If Don is alive, Don and Betty may find the joke funny and flattering. If he’s dead, Betty will tell you your costume is in poor taste and become angry, but she won’t know who she got angry with because you were disguised in a costume. If Don is dead, there’s also a chance she’ll believe you’re his ghost and you might be able to say you’ve returned to give her an important message about writing a check to her neighbor, Laura. Once you’ve determined Don is dead, and you want to ask all the juicy questions about whether she killed him, you should just ask away and not worry too much about looking like an ‘insensitive clod’ because if you’re the type of neighbor who didn’t know whether a neighbor’s husband has been dead for the past five years, I’m willing to bet your reputation as a neighbor wasn’t sky high to begin with. Note: Laura, I’m curious whether you murdered Don, but nobody noticed he was missing and it’s bothering you that not one person took note of your brilliant plan. Today’s guest panelist will be my best friend Todd. Todd: Laura, have you considered checking the Internet archives of your local newspaper for Don’s obituary? Paul: Todd, paying to access her local paper’s archives could cost as much as $4.99, a completely unnecessary expense when ‘donning’ a Don costume for Halloween might only cost $2.00 according to my imagination of how Don dresses, and that $2.00 would also be offset by receiving free candy. Submit your questions on the Dear Good Greatsby page. Please also add some comments to the Dear Good Greatsby page. Readers go to the page to make submissions but never leave comments and the page is beginning to look embarrassingly lonely. ← Now Hiring Post-apocaplyptic Workforce–Apply Today! Perhaps Don killed himself because he had such an irritatingly inattentive neighbor? We never know how our poor neighboring might cause others to become despondent. I can’t believe I completely passed up that opportunity to feel guilt. It’s never too late to feel guilty. Don’t put it off any longer–start today. Laura, I like the solution of asking Betty if you can date Don. Please let us know how that goes! Greatsby, I think the real crime is that your friend made his wife park the car. Did he have a broken leg or something? He’s a terrible parallel parker. How is he on reverse? A delicate subject indeed. The big indicator for me is a months worth of newspapers on the porch; a lawn that hasn’t been mowed in months,; and stray cats whining for food a your back door. Seems like you’d make a much better detective than I would. “I’ll interview the murder victim later;…” *sigh* That is Airplane! funny. I can visualize Leslie Nielsen saying the same thing. I’m sick of murder suspects insisting the murder victim is still alive. I’m the detective here and I’ll be the one who decides who’s alive and who isn’t! Tell her to just carry on and don’t ask questions. She could be next! No one likes a meddling next door neighbor. We have enough movie evidence to confirm pesky neighbors asking about another neighbor’s suspicious disappearance often end up dead. Those are all great ideas! But it makes me wonder, another blogger I follow, just wrote about the same problem, not knowing if her neighbors are dead. And that she was noticing lots of giant mutant flies around lately. Is unknown dying neighbors an epidemic we need to be concerned about? I definitely think two separate instances of not knowing whether a neighbor is dead certainly give me enough evidence to justify a complete paranoid freak out. If Betty killed her husband and hid his body in my house, causing a massive fly invasion, then she’s an even worse neighbor than I am. I like the Halloween costume idea cause, you know, candy. Todd seriously needs to grow some imagination. And get new glasses. I mean, it’s like he’s trying to look like you or something. Those are actually my glasses Todd is wearing in the picture. I’d pick free candy EVERY. TIME. Laura, bake some cookies and take them over to Betty/Beth…..take like 4 dozen and see if she says something like “OH my I will never be able to eat this many cookies myself”…tell her you will put some into her freezer in the basement (that’s were every old ladies freezer is right?) and then look to see if Don is in there…. That’s a great idea. Bring her a casserole for a dozen and ask if she can have your bowl back by the next day. She’ll have to say she could never finish so much casserole by herself in one day. Dating in heaven… This is a huge, untapped market! Adult-Friend-In-Heaven Finder.com. I smell a business opportunity! Business license and trademark pending! Oh Good Greatsby you make me laugh!!! Then a little while later she said, “We need to move the water line from the house to the garden. I told the plumber to save money, my husband will dig the hole.” Then she handed me the shovel. I dug a hole deep enough to bury me in. Am I still alive? I think it’s good for spouses to have a small amount of fear that the other partner is plotting to kill us. I treat my wife a lot better as a result and constantly bring to her attention all the very complicated and time-consuming paperwork she would have go through if something happened to me. Don is probably lawn fertilizer by now. I think Todd may be dead but no one realizes it…. So funny! Now I’m curious how you knew the price of checking the internet archives. Thanks for the laugh, goodgreatsby! Does the house reek of Lysol and potpourri? Maybe they are covering up a dead body stench. I would also ask if you could store something in their deep freezer- maybe he is in there. All old peoples houses smell of lysol and pot pourri. We need more detail! Laura, I hate to be the one to break this to you, but you are most likely the one who is dead. (cue creepy music) I’ve heard it’s happened to Nicole Kidman and Bruce Willis. A few signs may be if Betty starts screaming in horror whenever you’re around, or runs off to get an exorcist. She does, but people have always reacted to me that way, so I don’t think we can draw any conclusions from it. As a next door neighbor of Don’s, he never let me borrow a cup of milk. But, in retrospect, I think he was looking out for me, because they drank 2 percent and let’s be honest – that goes straight to the hips. Plus, they probably needed it more than me for the calcium so they wouldn’t break THEIR hips. Ah, the irony. Must be a different Don. Mine would have explained exactly what kind of milk you should be drinking, and why, in great detail. One of my neighbours (no idea of name) I have seen just once in 2.5 years, his constant banging on the walls stopped over a year ago so I’ve thought nothing more of it. This thread has made me think he was probably locked in a wardrobe all along and the banging was a cry for aid while his home-help stole the silverware. What’s this I hear about Don Johnson?! The rumors of my being related to Don Johnson have to stop! Just because we’re both handsome and fought Miami drug dealers in the eighties, doesn’t mean we have any connection! It seems to me that the simplest way is to bake a few muffins and take them round on the pretence of knowing that they are Dan’s, sorry Don’s, favourite. If he’s alive Betty will accept them, if he’s dead she’ll throw them at you. If he’s left her she’ll want to know how you know that they are his favourite. I could use a good Miss Marple to do most of the heavy lifting. I prefer to be the partner who sits back until the end when I step forward to take credit. I think my favorite advice columnist may be secretly in love with me. 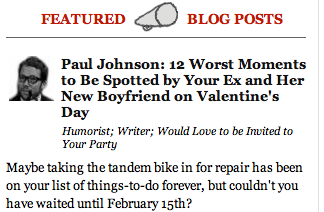 Today he featured my letter in his column and gave me some wonderful advice, but he also misspelled my blog’s name. He once wrote about having trouble remembering names, and I confessed that I did too, so I think this must be a subtle reference to that special moment we shared. Or maybe it was his wife who had trouble remembering names and he had trouble remembering faces, but whatever. It was special. Speaking of his wife, I think he may be married. But it’s more likely that he made up all those stories about a wife and kids to cover up the fact that he’s secretly in love with me, isn’t it? Anyway, my question is: why is he keeping his love for me a secret? Is he ashamed to be seen with me? P.S. The link in the article is right; it’s just the anchor text that’s wrong. But seriously — this was hilarious, thanks. I’m going to try the Halloween costume idea. I’m a little concerned that if Betty did kill Don, she might mistake me for him and kill me on the spot, but that’s a small price to pay for free candy. I feel your pain. I too have had a world-famous smoking jacket wearing blogger who shall remain nameless secretly in love with me (see last week’s Dear GG). Sometimes people don’t understand (or believe) us. 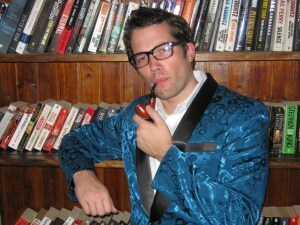 Yours wears a smoking jacket too? So does mine! What a coincidence! Another reason I know that mine is secretly in love with me is that he’s published a series of love letters to various women, but has very carefully avoided mentioning me in any of them. Sorry, I absolutely know the name of your blog off the top of my head, but sometimes my wife hacks my account and makes these changes in the hopes of offending bloggers she worries I might be in love with. Any time this blog contains a mistake, you can assume it was my wife’s fault. In New York we say unless you smell something funky coming from your neighbor’s apartment it’s better not to ask. You have no idea what you might be getting yourself mixed up with. I mean, Don could be sleeping with the fishes and then you’ve just insinuated yourself as the “meddling” neighbor. A work of a genius. Suspense, adventure, lots of humor, juicy, a gossip delight . Reminds me of the mother of Jason’s bestfriend in True Blood! Truly enjoyable post, no need for my detective’s skills. A work of genius full of suspense, adventure, humor, and juicy gossip was exactly what I was going for. Thanks for truly getting my writing. I just wrote a post the other day wondering if my neighbors are dead or not. Are you stalking me? This is getting scary, actually, because I wrote about flies a few months ago. 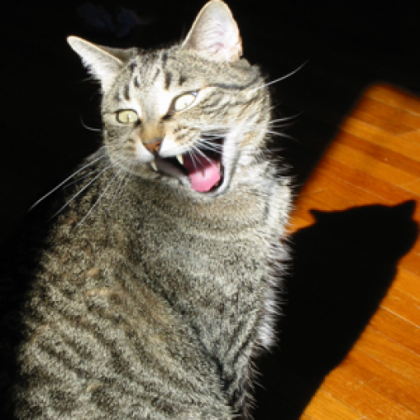 Another reader mentioned your post. I’m a bit worried disappearing neighbors might turn into an epidemic. Have you ever considered maybe Don is in prison for embezzling money from his company like the guy who went missing across the street from us growing up but he’s out now and we all just act like everything’s normal when it ISN’T normal? The guy was my friend’s DAD and I SLEPT OVER THERE and now he’s an ex-con but walks around my city like NOTHING and when Stacey’s son was on my son’s soccer team and he came to the games we pretended not to know each other but we DID. We DID know each other back when he was embezzling. Before he was in prison. Don was retired, but other than that your scenario seems totally plausible. Oh, and I get that you’re emphasizing that you slept over there to show how well you knew him, but at first I read it as horror that a defenseless child spent the night in the same house as a dangerous embezzler. Betty definitely killed him. And probably carried him out of the house in the dead of the night in suitcases. See Laura, if you were a better neighbor, you would have been sitting by your window with your binoculars, keeping tabs on her goings on and be able to report any suspicious activity to the police. What do we have to do to make you a better neighbor . . . break your leg? It’s sad that it always seems to require a broken leg and a gift of binoculars for us to start taking an interest in our neighbors. The problem is, they live next door to me, not behind me, and “Side Window” just doesn’t sound all that interesting. Sorry, but the fact that you live on the side makes you an even worse neighbor. I assumed you lived behind them because you wouldn’t be able to see anyone going in or out the front door like you could from the side. Did Betty ever ask you to pet-sit Don while she was out of town? Is he in YOUR backyard? You should wait until Betty leaves one day, then break into their house like they always do on TV. Then you’d find out for sure. There must be some evidence in the house one way or another, and the worst that could happen is that you’d get arrested. And I’m willing to take that chance. I just want to say: before you do anything, get an old fashioned giant camera flash. Oh, and remember: penguins live in the South Pole. Has Betty put up any vulture-specific scarecrows lately? Was Don partial to wearing clothes in beige? Some studies suggest that OAPs wearing this colour have to known to vent their unresolved anger in what’s also known as ‘beige rage’. It’s quite possible ‘The Don’ actually killed the wife and assumed her identity. Next time you speak with the ‘wife’, look out for a faint stubble, or a hint of Brut 33.